This chapter describes in detail Solomon’s palace he had built. Solomon built his palace in 13 years, using cedar wood from Lebanon. He made a palace area for Pharaoh’s daughter, his wife. He hired a man from Tyre, Huram, to work the bronze. His palace was magnificent as was God’s temple, which he had brought in all the things David had dedicated to God and placed in the temple’s treasuries. 3) It gives us a time reference for other dates in the Bible. It tells us this was a massive undertaking for God and for his palace, requiring a lot of manpower, money, and time and effort. It also shows us that Solomon spent nearly twice as long building his home than he did building God’s home. It shows us that although Solomon loved God, he appeared to love himself more. 4) Part personal Question. My answer: Huram “whose mother was a widow from the tribe of Naphtali and whose father was a man of Tyre and a craftsman in bronze. Huram was highly skilled and experienced in all kinds of bronze work. He came to King Solomon and did all the work assigned to him.” Huram used his skills to serve God and God’s people. We can serve God with our time, efforts, work, money, talents, and skills. 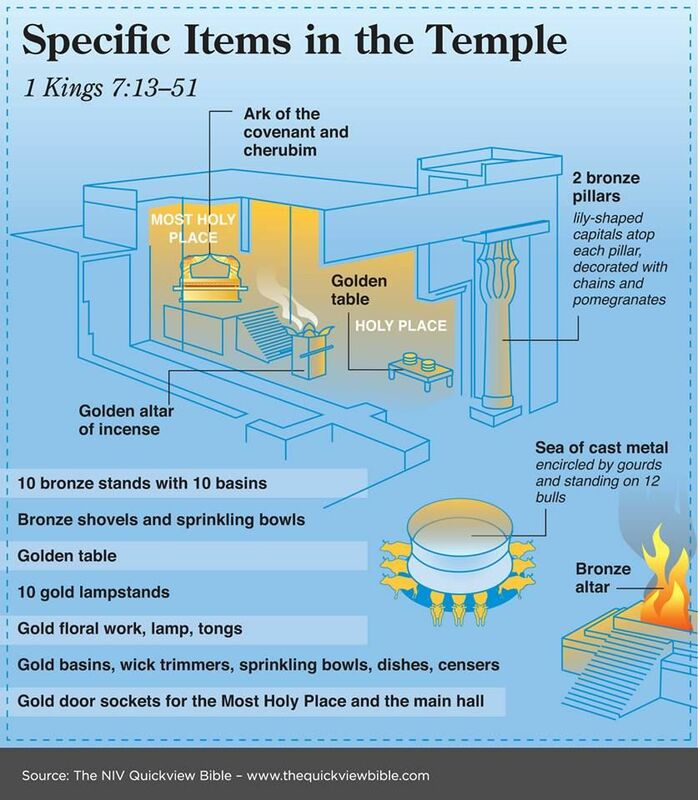 5) All the temple furnishings and vessels were used in some way to worship God, such as for burnt offerings and to hold the bread of presence, to atone for our sins through sacrifices, and to give us a place to meet with God and for Him to dwell amongst us. They point to Jesus and the day where we won’t need any of this and we will just inhabit the earth with God and Jesus. We see the opulence of Solomon’s palace and God’s temple, a great example of the blessings God wants to give us if we obey Him. God deserves only the best, and He got the best. 1 Kings 6:38 tells us that Solomon spent 7 years building the temple, but here we learn that he spent 13 years building his own house. The temple was glorious, but it seems that Solomon wanted a house that was more glorious than the temple. So much magnificent cedar wood from Lebanon was used to build Solomon’s palace that they called it the “House of the Forest of Lebanon.” Walking in the richly-paneled walls of the palace was like walking in a forest. 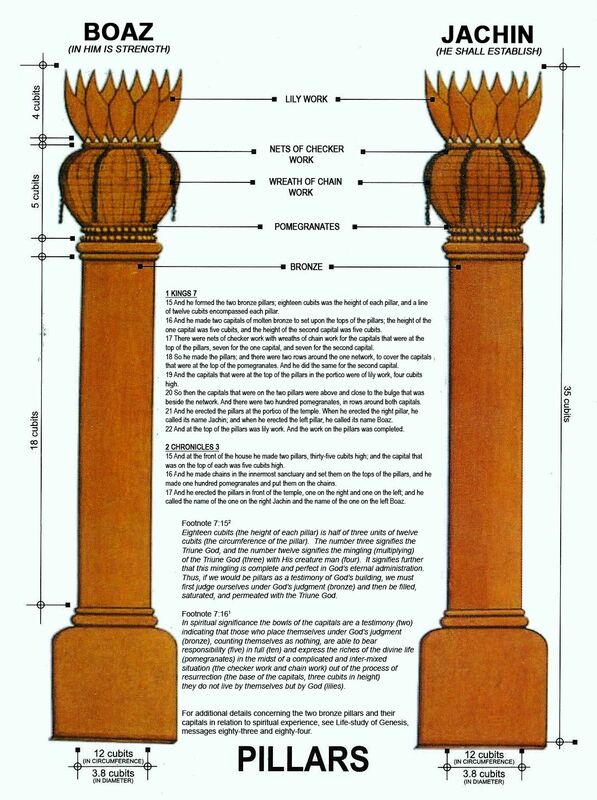 The forty-five pillars set in the House of the Forest of Lebanon also gave the impression of being in a majestic forest. 1 Kings 10:16-17 mentions 500 gold shields that were hung in the House of the Forest of Lebanon. Isaiah specifically called this building an armory in Isaiah 22:8. At the end of the detailed, magnificent description of Solomon’s palace, the writer also mentioned that some of the great architectural features of the palace were also used in the house of the LORD. We are left with the idea that as great as the temple was, Solomon’s palace was better. When one travels in old Europe today, you often see magnificent cathedrals. These amazing buildings were mostly built hundreds of years ago at great labor and cost to poor people who could never dream of living in such spectacular places. When their most magnificent buildings were churches, it said something about their values. When Solomon made his palace more spectacular than the temple, it said something about his values. Our most magnificent buildings in the modern world – usually given over to business, shopping, or entertainment – say something about our values. Haggai 1:3-10 speaks powerfully to those who think more about their house than they do the house of God. Huram was half Israeli and half Gentile, and he was the best craftsman around. The magnificent temple and palace built by Solomon came to symbolize Israel’s Golden Age. Solomon built many leading cities, assuming control of vital trade routes. He fortified Jerusalem, the capital, with a wall so thick that parts of it still stand. He modernized the Israelite army with 12,000 horses and the first chariot brigades, and made shrewd alliances with neighboring countries. These impressive pillars were actually so noteworthy that they were given names, Jachin and Boaz (mentioned also in 2 Chronicles 3:17). Some believe that the pillars were meant to remind Israel of the twin pillars from the Exodus. The pillar of fire by night and the pillar of cloud by day were constant reminders of the presence of God in the wilderness. The temple was established by God, and built by the strength of God. Every time the Israelites looked at the temple, they knew that God liked to establish and strengthen things. The house of God was a place where people experienced what the pillars were all about. People were established in their relationship with God and given strength from the LORD. Much of the temple stayed off-limits to the general public; only priests were allowed in. Not event priests ventured into the Most Holy Place, except on special occasions. Solomon had not intended the building for humans; he wanted a place suitable for God to dwell. The huge laver was more than 15 feet (5 meters) across, and was used for the ceremonial washings connected with the temple. “It was used by priests for cleansing their hands and feet and perhaps also to supply water to the standing basins for the rinsing of offerings (2 Chronicles 4:10)” (Wiseman). Poole believes that perhaps water came out of the bulls that formed the foundation of the Sea. 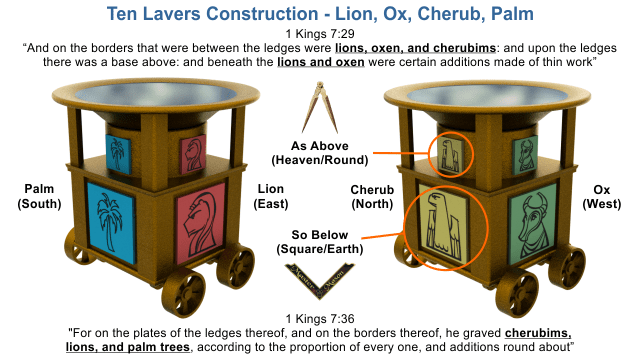 2 Chronicles 4:8 says there were 10 tables of showbread. Here, they are described collectively as a unit.